It’s truly a tragedy that Canada has lost one of its best novelists at such a young age. Paul Quarrington passed away yesterday. I had the good fortune to have Paul as my mentor for a writing course and his book, Boy on the Back of the Turtle, helped inspire my wife and I to go on a trip to the Galapagos Islands. If you want to read a truly great novel, find a copy of Quarrington’s Whale Music. Further to my previous post Games are the Way to Test Software, I wanted to mention the new Office Ribbon Hero game. Score points by using the ribbon, accept challenges and share your results with your Facebook friends. Can you imagine if you were new to Office how helpful this would be? It makes me think of the XT typing tutor game I played back in high school. It was similar to missile command--words falling down the screen and the player has to type them before they destroy bases. Great game. I ran into this Hyper-V subtlety, so I figure I’ll share it here and make it easier to find with a search. If you try to import a Hyper-V image and the import fails, you will not be able to use the same files to try the import again. Hyper-V actually deletes and alters files as part of the import process. The error you’ll likely see is “Import failed. Import failed. 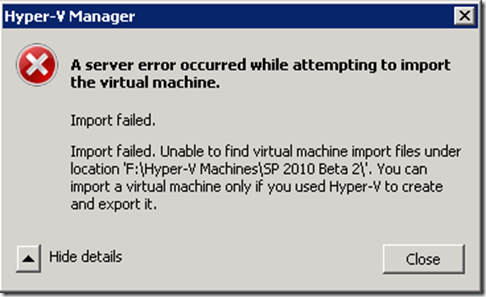 Unable to find virtual machine import files under location … You can import a virtual machine only if you used Hyper-V to create and export it.” At face value this error is infuriating since you are trying to import a Hyper-V export, but the fact that you’re running the import for the second time means that Hyper-V does not consider your source to be valid. 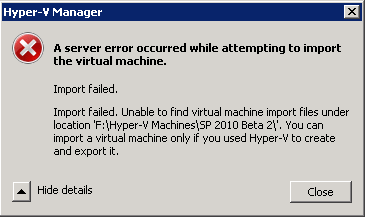 The lesson here is don’t try and import your exported Hyper-V image without first making a backup copy. If you have a backup, you can just copy over the small files again and not have to export or copy the large image files a second time. I have been using the Mozy online backup service for a while now, and while it is an affordable and convenient way to backup my laptop, it’s not a solution for syncing folders between my laptop, my home desktop and my work desktop. 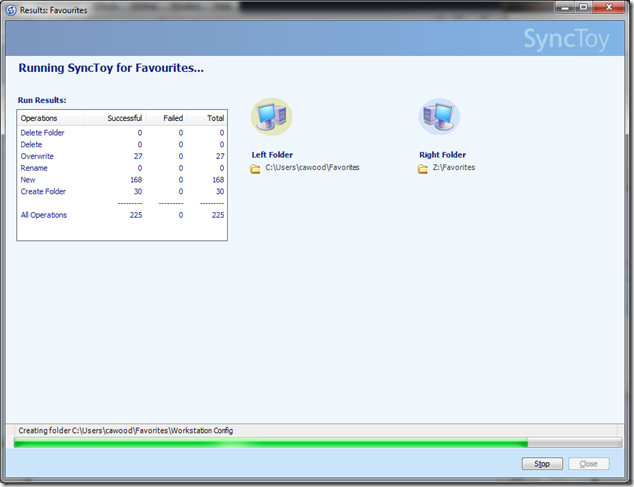 In order to resolve the sync problem, I decided to try Microsoft’s free SyncToy PowerToy. I believe that Microsoft SharePoint Workspace 2010 is where I will eventually go for at least part of this functionality, but a quick—not to mention, free—resolution is appealing to me today. UPDATE: If you're interested in this utility, you should check out the new version: Windows Live Mesh. While there certainly is a relationship between sync and backup, the two are not the same. The reason I want to backup my files is because I want to be able to recover something that was lost due to a failure such as a hard drive crash. The reason I want to sync my files is that I want to do things such as walk home from work and have the same file on my home machine that I was just editing at work. In fact, I don’t want it just to be the same file, it must be the same version of the file. Microsoft SharePoint can be useful for these scenarios, but I use it primarily for work. I use Mozy online backup to protect assets such as my vacation photos. I want to be able to sync because when I open my laptop on a plane (like I just did to write this post), I want the right versions of a bunch of files to be there. Furthermore, I may not know which files I want, so the sync is something that should happen automatically. 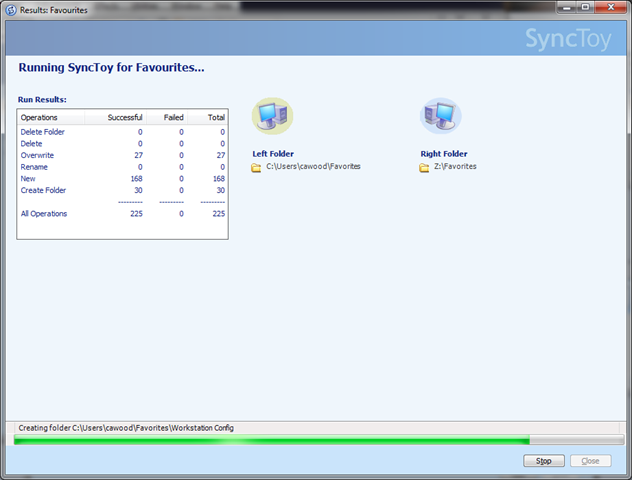 SyncToy is able to help with most of my files syncing needs. Using the tool, I can create a relationship between files shares on as many computers as I want and specify a few options for how I would like those files to be handled. Once I have my sync pairs created, I can run the operation and the files on my desktop at work will be synchronized with my files on my laptop. If you’re not sure what’s going to happen with the click the Run button, there is also a preview run feature that you can use to see what the operation will do before it runs. 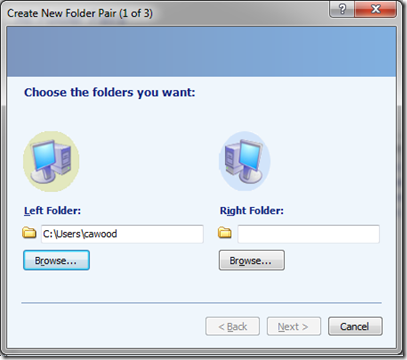 Note: Synctoy will write a file (.dat) to each folder that you add to a folder pair. 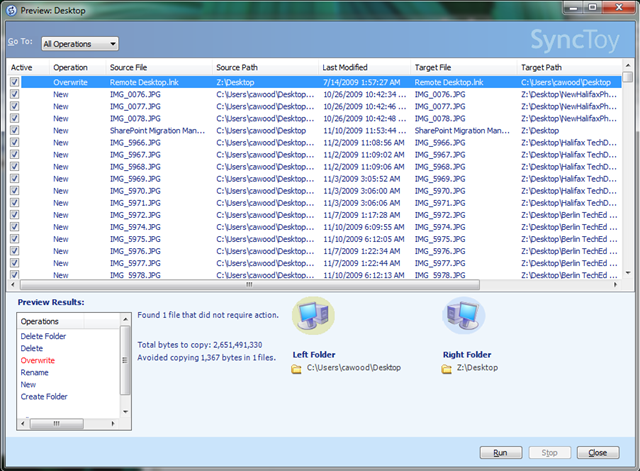 If you delete this file, SyncToy will no longer be able to run the synchronization. Since SyncToy does not have a way to configure a sync operation to run, you will need to use Windows Scheduler to automate the task. This is not ideal and doesn’t allow for real-time synchronization, but as you can see in the steps below, it’s trivial to set it up to run at a set time. While you do not have to schedule SyncToy to use it, some users may find it helpful to schedule recurrent SyncToy runs. Perhaps you have a folder pair that takes a long time to sync and you want to run SyncToy in the middle of the night, for example. 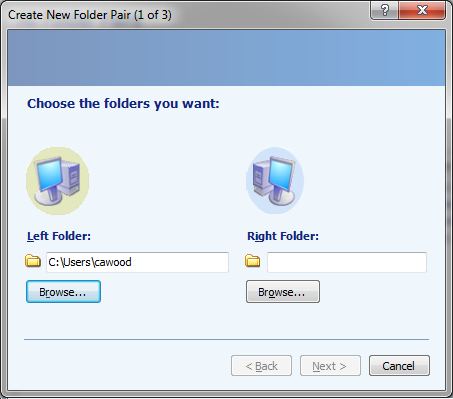 SyncToy does not provide a user interface to schedule folder pairs to run at designated times. However, there is a method to schedule tasks using the Microsoft© Windows© operating system. 1. From the Start menu, select All Programs - Accessories - System Tools - Task Scheduler. 2. Select Create Basic Task in the Actions pane on the right. 3. Add a Name and Description and select Next. 4. Choose when you want the task to start and select Next. 5. Choose date/times (if applicable) to run task and select Next. 6. Choose Start a Program option and select Next. 7. Select Browse and locate the SyncToyCmd.exe. 8. Type "-R" in the Add Arguments textbox. –R all by itself will run all folder pairs that are active for run all. If you want to run just a single folder pair, add –R “My Pair” to the end of the command line. Note: If the folder pair name contains a space, surround it with quotation marks… "C:\Program Files\SyncToy 2.1\SyncToyCmd.exe" -R "My folder pair." The weakness of SyncToy comes to light in the ‘stepping on a plane’ scenario. Today, SyncToy does not have a UI option for scheduling synchronization and even if you use Windows scheduler, you’re still not in the Nirvana state because a lot could happen between the time that your scheduled sync runs and when you get onboard your flight. However, despite these limitations, I’m going to be using SyncToy for the time being. 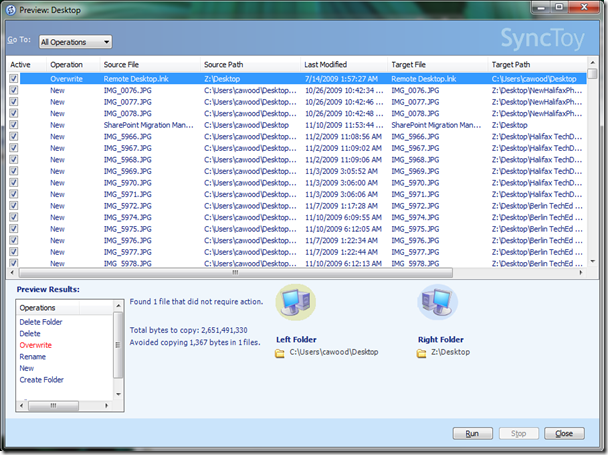 Try SyncToy 2.1 for free. I moved a while back and was amazed how many free shirts I still have kicking around. I thought I’d pick the most relevant ones and do a quick history of SharePoint ECM through clothing. Note: If you want to do an animation like this, I recommend smiling. While no expression is easier to duplicate, there’s less chance that you’ll look like the psychotic killer in a Criminal Minds episode. NCompass Labs was located in Vancouver, Canada. NCompass Resolution was built to be a platform for creating websites with content management features and it would go on to become Microsoft Content Management Server (MCMS). MCMS was the basis of today’s SharePoint publishing sites functionality. SharePoint Portal Server 2001 and MCMS 2001 were released. At this point, SharePoint was an application designed to build Intranets. MCMS was built as a development platform for web content management. The fact that both could be used to build Intranets caused confusion—some people liked to say that SharePoint was for Intranets and MCMS was for public sites, but that wasn’t accurate. MCMS was moved to the newly created E-Business Servers division and SharePoint was in the Office Servers division. MCMS 2002 was released primarily to add support for .NET developers. The marketplace confusion about the two content management products from Microsoft continued. The E-Business Servers division embarked on the Jupiter project which was a vision for an integrated suite of business products including BizTalk and MCMS. SharePoint Portal Server 2003 was released. SPS added key features and scalability. SPS also kicks off the SharePoint vision to be both a platform and an application. The E-Business group is dissolved (because of their taste in shirts?) and the MCMS team becomes part of the SharePoint team. A key aspect of this timeframe is that the SharePoint partner ecosystem grows dramatically. Because of this, I threw in a couple of partner shirts. More ECM features are added to SharePoint. Aside: I left out the speaker shirt from TechEd New Zealand. As native South Africans, my brother would never forgive me if I published a photo of me wearing the silver fern. But to be fair, I had a fantastic time, met some great people, and hope to go again. Microsoft Office SharePoint Server (MOSS) was released and SharePoint gains the impressive title as the fastest product to grow to 1B (in yearly revenue ) in Microsoft history. The market clearly demonstrates that it wants one solution that is both a platform and an application for building websites. Also, SharePoint gains significant mindshare as a solution for public internet sites. At the end of the decade, SharePoint 2010 Server and SharePoint Foundation are in public Beta—both receiving favourable reviews. 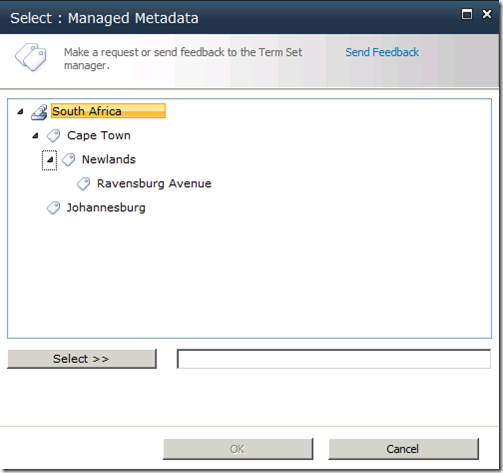 This post is part two in a series that I’m writing about SharePoint 2010 Enterprise Managed Metadata (EMM or ‘taxonomy’). If you haven’t set up a SharePoint 2010 development environment yet, you may also want to check out SharePoint 2010 Beta 2 install. There are two types of tags in the new SharePoint 2010 taxonomy system: managed keywords and managed terms. I’ll cover each one and give example of how users can take advantage of the various features that each type enables. 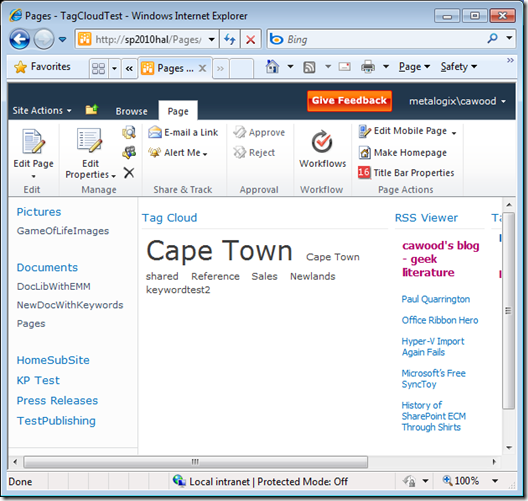 Keywords are used to informally tag content within SharePoint. Instead of relying on a centrally managed store of terms that they must choose from, keywords allow users to add their own tags. 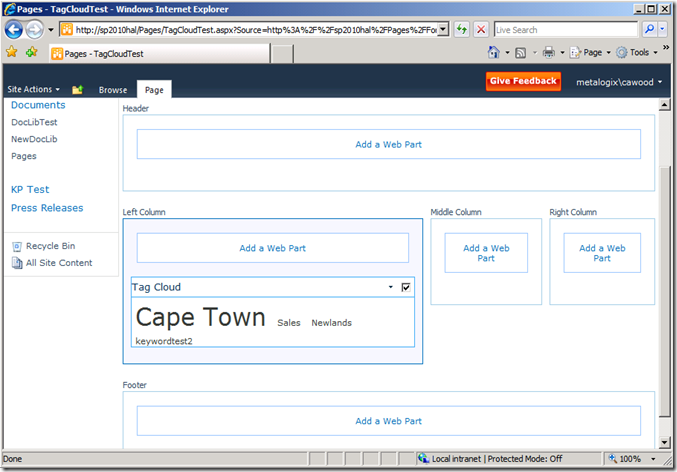 This means that faculties such as folksonomy and informal tag clouds are enabled. Note: Managed keywords are stored in a separate single database and do not have a hierarchical structure. 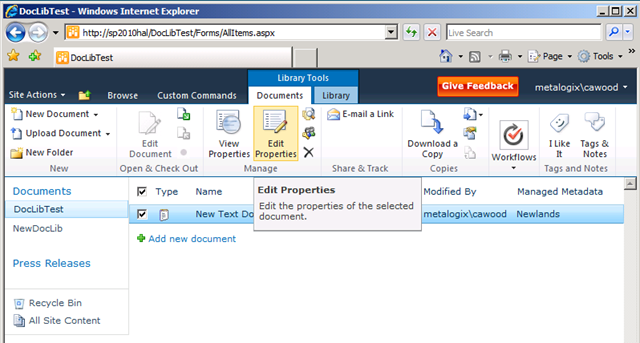 To add a managed term to a document, first select the document in the document library and select Edit Properties. 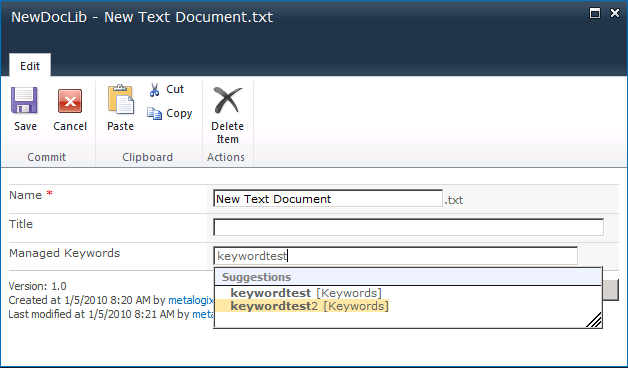 Once you have the edit document properties dialog open, find the Managed Keywords field and you can either start typing an existing keyword (which will prompt you with suggestions) or you can type in a new keyword. Once you’ve begun tagging things, you’ll probably want to be able to use that data in convenient ways. 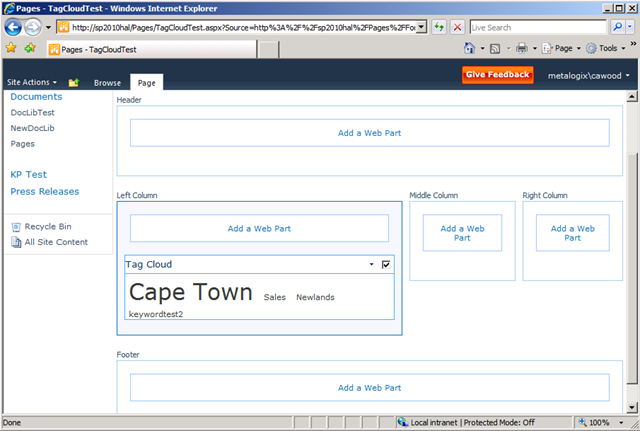 The tag cloud web part is a quick way to get a sense of the folksonomy being created on your SharePoint server. If you have sufficient permissions to create a web part page and add web parts, you’ll be able to add the tag cloud web part to web part pages. Once added, there are a number of options in the tag cloud settings. Note: A lot of features aren’t activated at the site collection level by default. 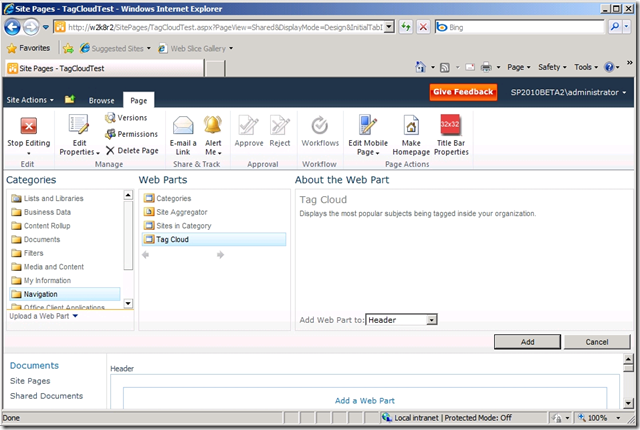 Activating the “SharePoint Server Standard” feature enables the Tag Cloud web part. If you find that you’re not offered the Tag Cloud web part, ask your SharePoint admin to investigate. Managed terms are placed in a central repository of terms. This enables consistency across users, provides hierarchical organization, and allows for strict information architecture. In the SharePoint Term Store Management Tool, users with sufficient permissions are be able to perform many operations on terms in the hierarchy. However, most users will simply use the terms from the central store. 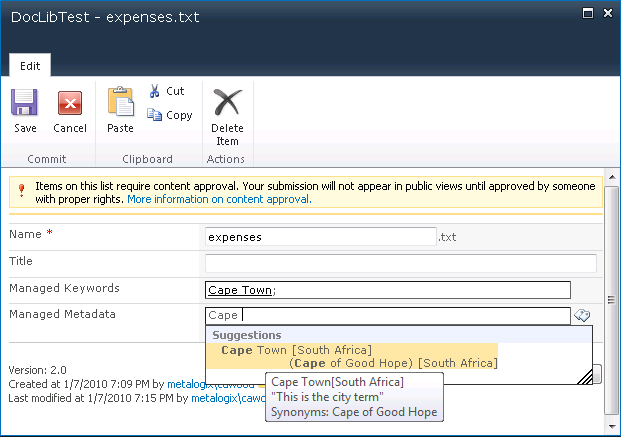 As with keywords, terms can be added to many types of content within SharePoint. 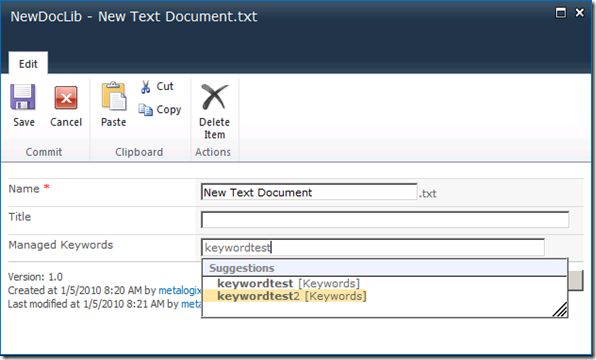 This example, will show how to add a term to a document within a document library that has already been enabled for tagging with terms. 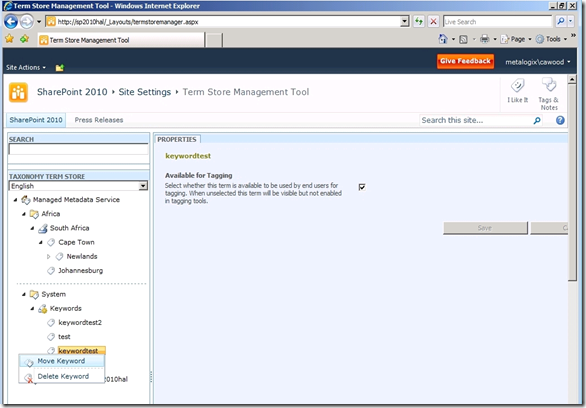 For more information about enabling a SharePoint 2010 Beta 2 document for tagging with managed terms, refer to SharePoint Taxonomy Part Three – Administrator Experience. To add a managed term to a document, first select the document in the document library and select Edit Properties. Once you have the edit document properties dialog open, find the managed metadata field and you can either start typing a term or click the “Browse for a valid choice” icon on the right. The screenshot below shows the suggest as you type feature which will show terms that match your partial input. Also, in the box below, you can see the labels (synonyms) and the description which helps users understand how different tags should be used. 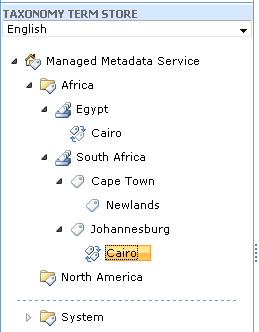 Managed Metadata can also be used to enable some cool navigational features within SharePoint 2010. For example, if you go to a list that has a managed metadata column, you’ll be able to filter the view by simply selecting one of the terms being used in the list. This enables the end-user to instantly filter lists without having to create a custom view. 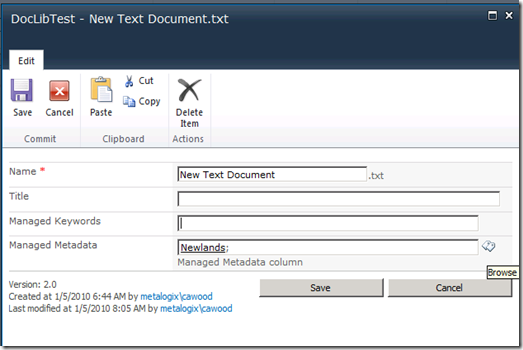 This post is part three in a series that I’m writing about SharePoint 2010 Enterprise Managed Metadata (EMM or ‘taxonomy’). If you haven’t set up a SharePoint 2010 development environment yet, you may also want to check out SharePoint 2010 Beta 2 install. As a SharePoint administrator, the first step when using the new EMM features is to learn how to use SharePoint Term Stores and research the details for creating a SharePoint Taxonomy Hierarchy. You’ll also want to read Microsoft’s best practices and make use of the managed metadata planning data sheets. You can find those links at the bottom of my post SharePoint Taxonomy Part One – Introduction to SharePoint Managed Metadata. After you have got your term store set up and you’ve decided how your taxonomy will be organized, you’ll need to set the permissions on your term store and enable various content for tagging. Remember that there are two types of tagging: managed keywords and managed metadata. Managed keywords are used for informal “folksonomy” style tagging and managed terms are used for centrally controlled and delegated hierarchical term structures. Step 1: Add an administrator to your term store. I covered this process in Using SharePoint Term Stores. Step 2. Create some terms. I covered the details of this topic in SharePoint Taxonomy Hierarchy. To use managed terms, I had to add a new column to my document libraries. To do this, first go to the list you want to enable and choose the Library tab from the ribbon, then Library Settings from the Settings area. Once there, choose Create Column. 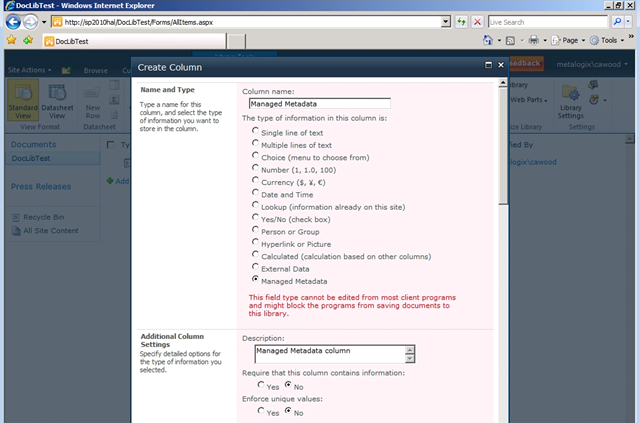 When the Create Column dialog opens, choose the Managed Metadata column type and give it a name. You’ll also be able to choose options such as whether you want to allow multiple values. After adding this column, you should be able to edit the properties of a document in the document library and see a new option to choose managed terms to put into the new managed metadata field. Click on the little tags icon on the right of the field to browse your term store. One philosophy for building a taxonomy is to let the users decide which terms are important. In SharePoint 2010, there are two ways to achieve this. First, you can allow “fill-in” keywords in your term sets. Secondly, you can allow users to tag with managed keywords and then choose to promote some (or all) of them to managed terms. 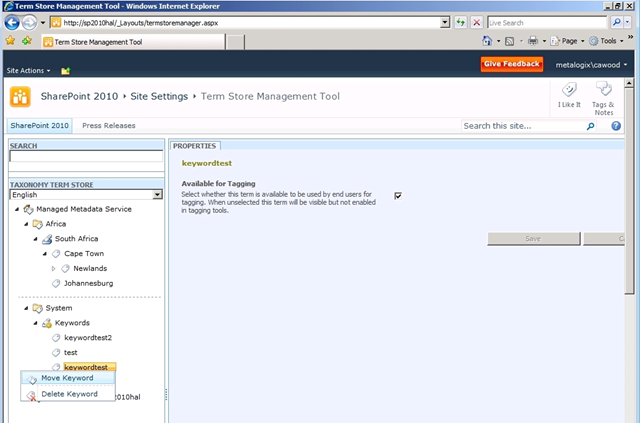 To change a managed keyword to a managed term, you simply open the term store management tool (from central admin or site settings) and use the "Move” option to move the keyword into the term hierarchy. 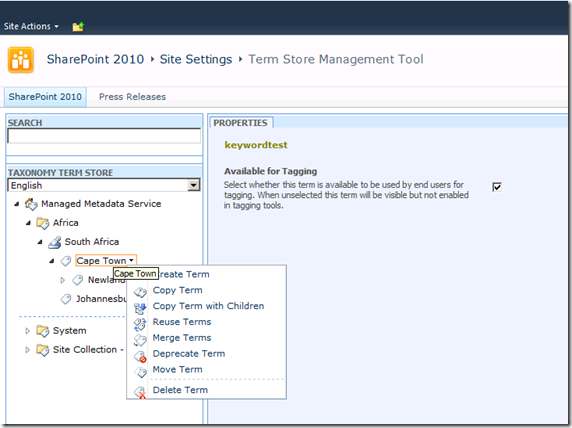 Note: It is not possible to move a managed term to the keywords store. In other words, you can promote a managed keyword to a managed term, but you can’t demote a term to a keyword. A polyhierarchy enabled tree can include leaves (nodes) that have more than one branch (parent node). In SharePoint Server 2010, you can create a polyhierarchical structure with the Reuse Terms action in the Term Store Management Tool. This example doesn’t really make sense, but let’s just imagine that I had used terms that weren’t as regimented as a geography. Say, for example, I had used people instead and the Term Sets defined teams to which they belong. In that case, a person could be on more than one team and therefore, you might want to reuse the term. For simplicity, the screen below shows the same hierarchy used in my other examples, but the Cairo term has been reused and it now appears in two different locations in the tree hierarchy. If you look at the properties of the term (see screen below), you can see that it now belongs to two term sets. - When you create a new term store, make sure the application pool is running. - the Term Store Management Tool (TSMT) is available in Central Administration (and site settings). This tool manages terms centrally for the whole farm and can be used to create, copy, reuse, move, duplicate (for polyhierarchy), deprecate, delete and merge terms. 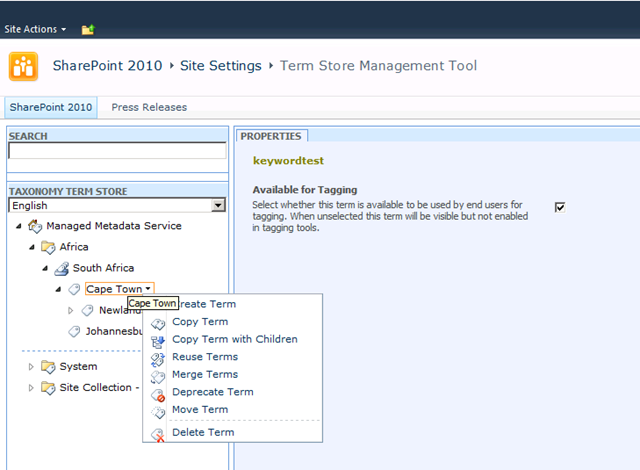 The TSMT is also used to manage permissions on term stores. 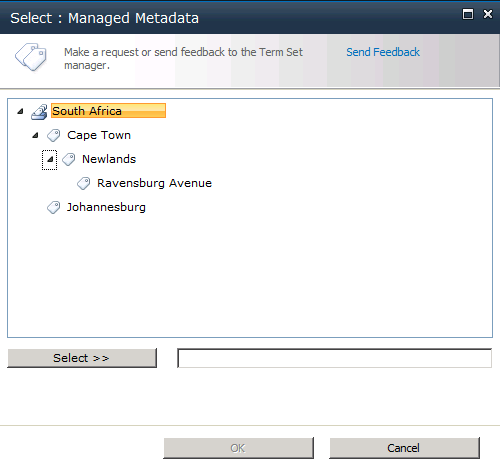 - The Managed Metadata column can allow multiple values. - All managed keywords are stored in a single non-hierarchical term set called the keyword set. - Site collections can optionally use their own term sets at the column level rather than use the central term store. - You can enable fill-in choices with a submission policy, this enables folksonomy. - Multilingual (MUI) terms are available. - Terms can be labelled to create synonyms that help users figure out which term to use.